Cire Services and ECOSS have partnered to bring you a series of Gatherings of….. This program offers tasters into the Creative Industries. Held at ECOSS on the final Sunday of the month. 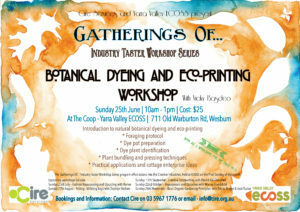 Sunday 25th June 10am-1pm: Botanical Dying and EcoPrinting with Vicki Basdeo! Bookings and Information: Contact CIRE on 03 5967 1776 or email info@cire.org.au Discounts apply for booking for all 6 workshops!